The long winter months are often associated with bleak, bare and colourless spaces in the garden, but this need not be the case! The solution is to fill the gaps with winter-flowering plants. Plant them during the autumn months of April and May to guarantee glorious colour until spring. What plants flower in winter? How should I plan my winter flower garden? When choosing plants, find out the height they reach at maturity. Create a layered effect by planting taller bedding plants, like foxgloves (digitalis), at the back. Medium height plants such as poppies work well planted in the middle, while low-growing annuals like the pansy, fairy primula and lobelia look stunning as edging plants at the front of the border. Alternatively, plant spring-flowering bulbs in between your winter seedlings. Most bedding plants can be grown in containers and these can be used to add colour to your patio or entrance during the winter months. 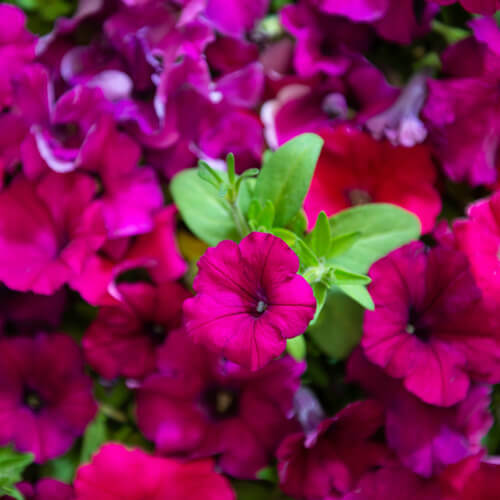 “The trailing growth habits of lobelias, alyssum and petunias make them good plants for hanging baskets. Petunias interplanted with pansies in a harmonising colour and with a touch of white alyssum make a lovely container planting. “Try a yellow, white and blue colour scheme with marigolds, blue petunias and white pansies. Or fly the flag with black pansies, red snapdragons, blue lobelia, and just a touch of white and yellow!” adds Beverley. How do I ensure the success of my winter flower seedlings? Prepare the soil. Add lots of compost to the soil in the area where you want to plant the winter-flowering bedding plants. To improve the texture of sandy soil, dig two bags of compost and one handful of planting fertiliser into every square metre of soil. Remove debris, grass, weeds and stones, and then level with a rake. Transplant the seedlings. Water both the seedlings and the soil thoroughly. Remove each seedling by pushing from the bottom of the tray to avoid damaging the roots. Place the seedling in a hole in the prepared bed and plant at the same depth as it was in the tray. After they have all been planted, water well using a fine sprinkler. Learn each plant’s water requirements. Newly-planted seedlings need daily watering until they are established. Once they are settled in, they can be watered deeply but less often. This method of watering encourages deep root growth and is more beneficial for healthy plants than regular light sprinklings. Alyssum, dianthus, gazanias and petunias in particular need soil that drains well as they don’t like wet roots. Fertilise for growth. To promote healthy growth and prolific flowering, bedding plants require fertilising every two weeks. Foliar fertilising is best if the bedding plants are in competition with the roots of shrubs and trees for nutrition. This means that instead of applying fertiliser to the soil around the plants, fertiliser is sprayed onto the foliage of plants. For a quick and easy alternative for mass winter colour in full sun why not sow some seed? Seeds to sow now include alyssum, linaria, African daisy, Livingstone daisy, sweet pea and Virginian stock.